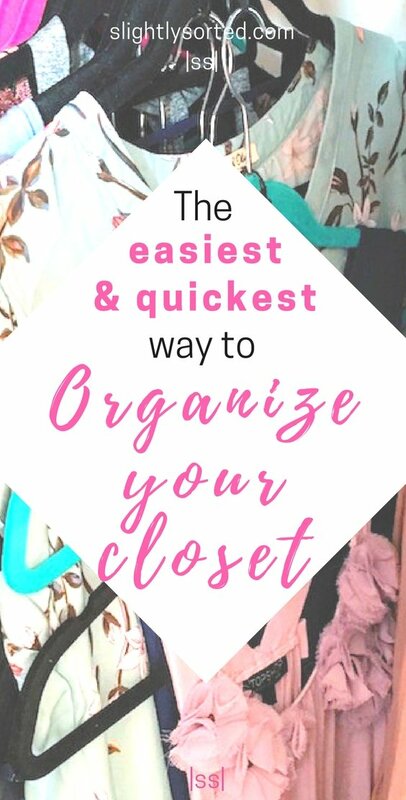 If you want to bring more order into your life, consider starting with these 10 easy tips to organize your wardrobe! Standing slumped in despair, before a messy wardrobe stuffed full of clothes you neither like nor fit into, does not make for a good start to the day! 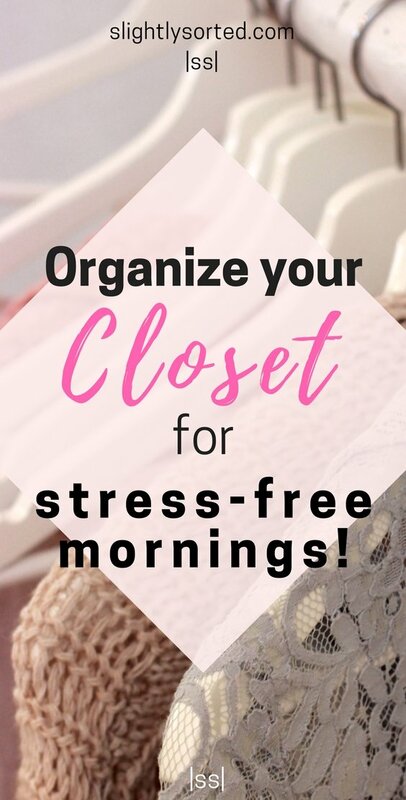 On the other hand, opening up to a super-organized array of beautiful clothes (all of which actually fit), can really help you to start off the day in a more positive and calm frame of mind. So, set aside either half a day or a couple of evenings, and dedicate the time to tackling that mess! A word of warning – half way through you will find yourself surrounded by mounds of clothes, feel completely overwhelmed, and wish you’d never started! But persevere, and when you stand before the contents of your super-sorted wardrobe, with a feeling of calm and a slightly smug smile on your face, you’ll be glad you did! Follow these top ten tips to organize your wardrobe, and you’ll have a closet to be proud of in no time! Let’s not labour this point, it’s kind of obvious. 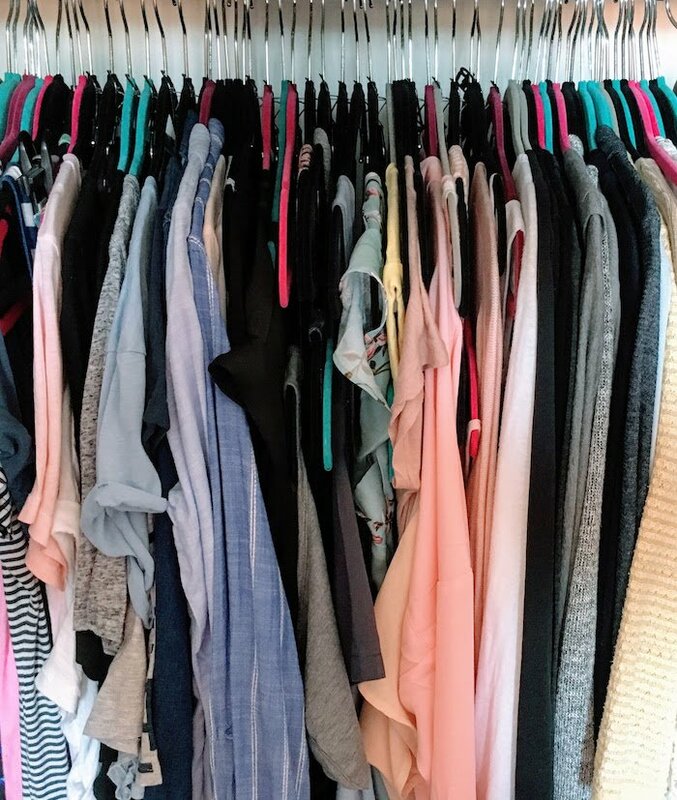 You can’t really organize your wardrobe if you don’t do this one. 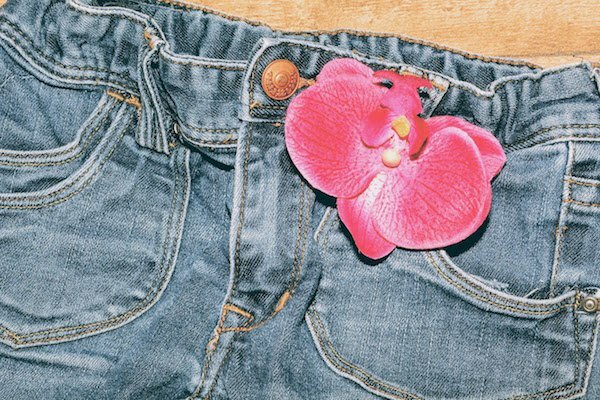 If it’s bunged full and yet you still never know what to wear, then you have got to be RUTHLESS in getting rid of stuff! First of all leave everything hanging where it is, and quickly pull out anything that you know straight away you want to get rid of. Just chuck it into piles – one for the bin and one for the charity shop/to give away/to sell (you can go through it later to decide which, just do the two piles for now). Then, with everything still in place, go through the wardrobe again and do the same – be even more ruthless this time! Get rid of all the stuff you’ve taken out, then sort your remaining wardrobe into two piles – 1) definitely want to keep and 2) maybe want to keep but not sure. Go through the ‘definitely’ pile and try to move some stuff over to the maybes. 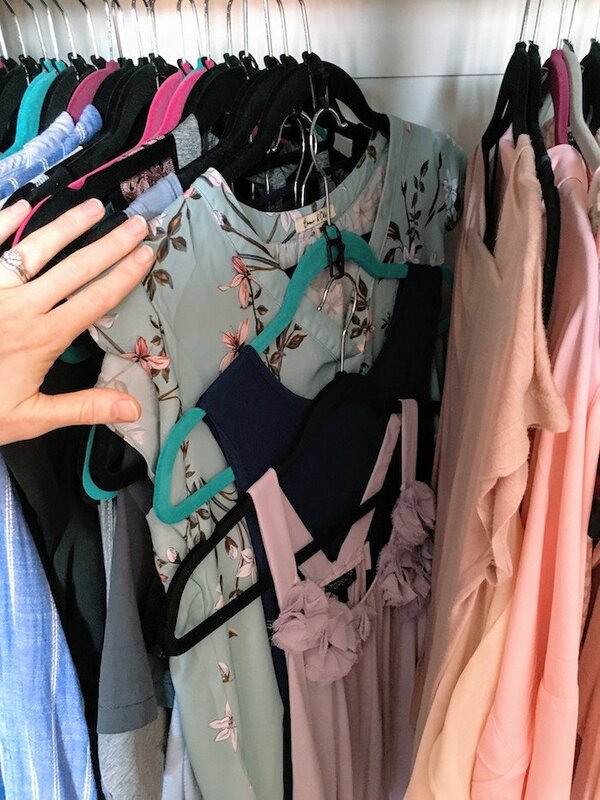 Anything that doesn’t fit, but you really can’t bear to get rid of, should be folded up and stored – even if you plan to lose/gain weight, don’t keep it in your wardrobe. Dress for who you are right now! Finally, go through the ‘maybe’ pile and be really brave! Try to let go of as much stuff as possible. When did you last wear it? Is it past it’s best? Does it flatter you or make you feel frumpy? Has your style evolved and you’ve out-grown it? 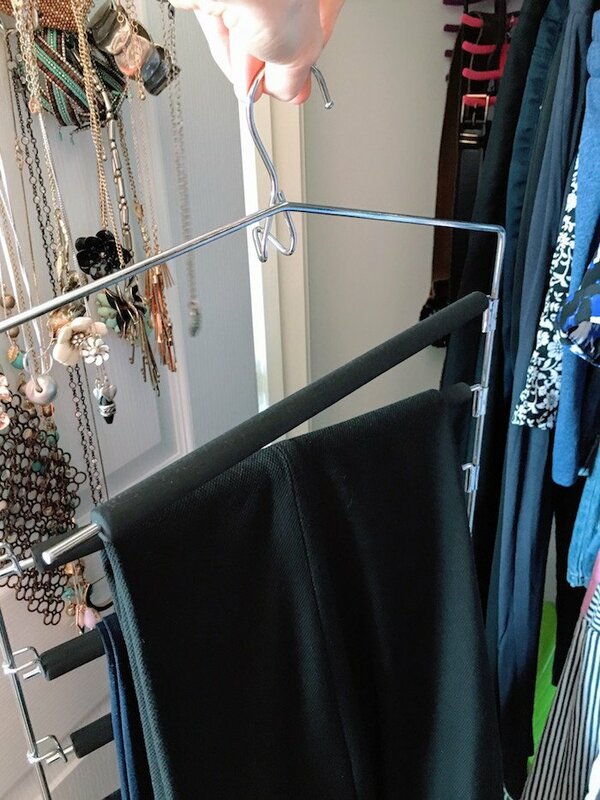 Continuing on the subject of getting rid of the clothes you don’t need – when you put all the clothes you’re keeping back into your wardrobe, put all the hangers in the wrong way round (so the hooked bit is facing out). When you put something back after wearing it, put it in the correct way round. Anything that’s still the wrong way round at the end of the season – take it on a trip to the charity shop! Get yourself some velvet skinny hangers! They don’t cost much and save LOADS of space. 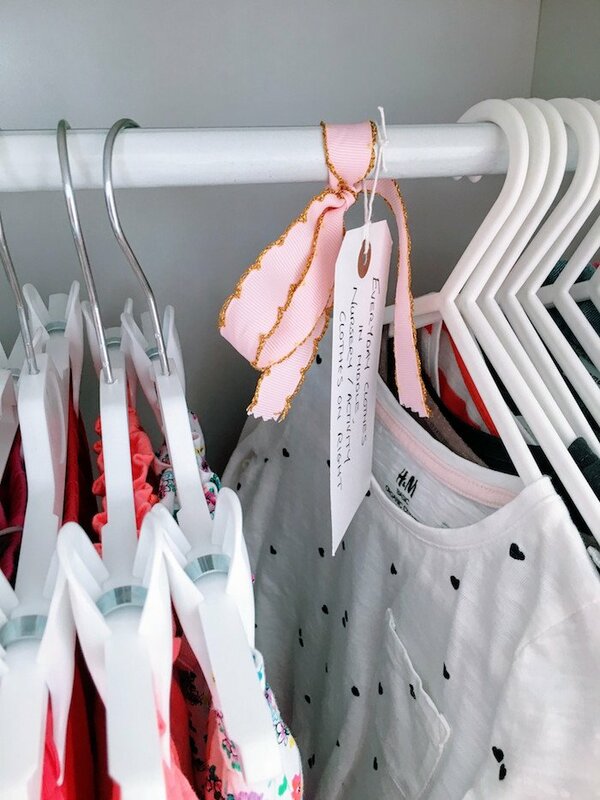 Plus, it just looks good when all your hangers match! These little things are great! Hanger connector hooks are so cheap and save sooo much space! Just pop one over the neck of the hanger, then you’ll be able to hang two or three items in the same space you were using for just one! You can use them in children’s wardrobes too. If your wardrobe has solid wood doors then knock in a couple of sturdy hooks. Use one for your ‘next day’ outfit (because of course, you’re that organized), and one for jewellery (see below). 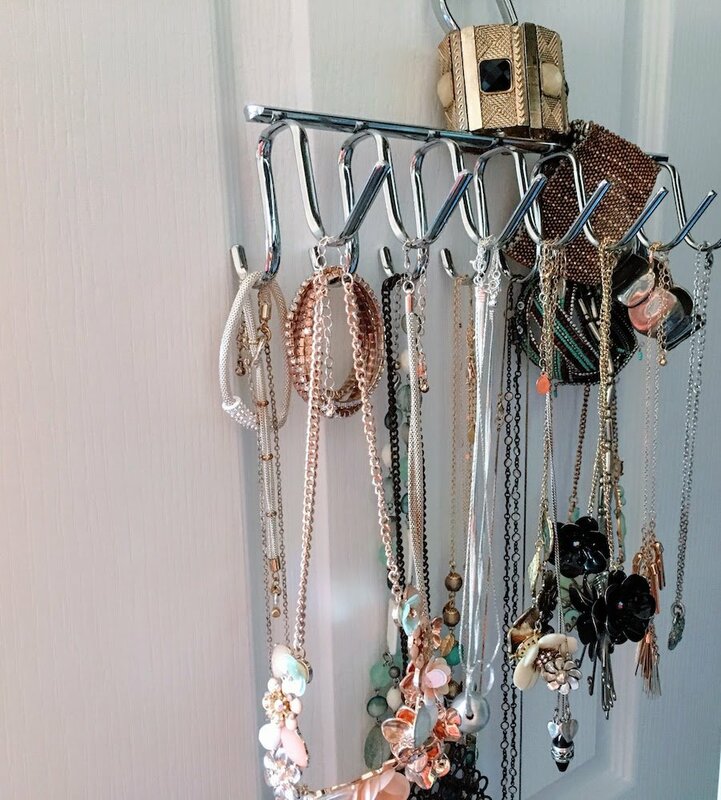 If your wardrobe doors aren’t strong enough for big hooks like this then grab some self adhesive ones and use the space for lighter items like scarves and necklaces. These pocket organizers are also good for socks/tights etc. You can keep it tucked away at the end of the main rail in the wardrobe, or hooked on the inside of the door. How much of the jewellery that you own do you actually wear? If you hang it up on the back of the door where you’ll see it every time you open the wardrobe, you’ll end up getting much more use out of it. Plus, it looks pretty! Try something like this sturdy and stylish accessories/belt hanger. This one’s robust enough to hang on the rail if you prefer, without having to worry too much about balancing out the weight on both sides. 7) Hang your clothes up! Hang up as much as possible rather than folding it. This way you don’t forget about stuff that lingers at the bottom of piles, clothes stay neat, and everything is more easily accessible. 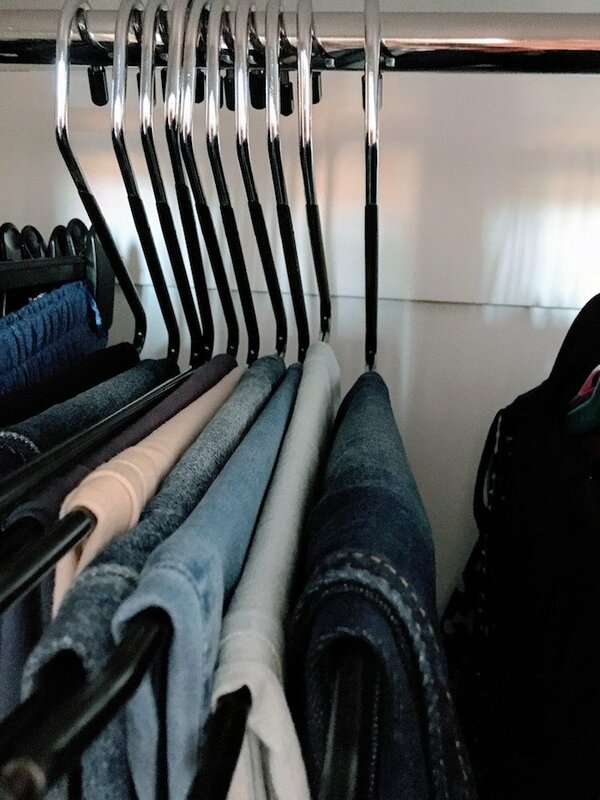 Below: you can some great hangers for jeans (great because they’re strong and don’t leave a crease mark); a swing-out trouser hanger that works well for work/suit trousers; and a nifty little hanger for sorting out tank tops and bras! Use a simple belt hanger for belts and scarves rather than piling them into a box. They’ll last longer, stay neater, and you’ll remember about them. Think about what sections will work for you. How about a combination of ‘type’ and ‘color’ sorting? 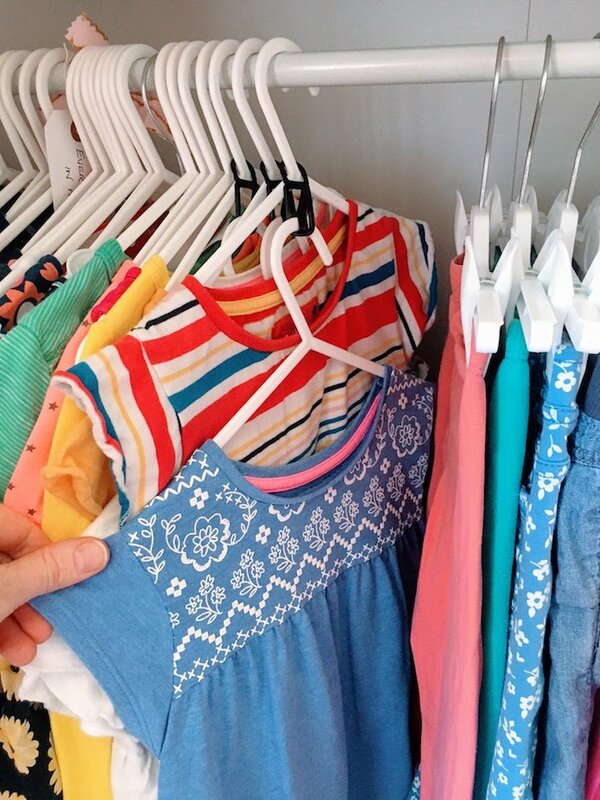 Try hanging all your dresses together, then all your jeans, then t-shirts in color order, shirts in color order, tops in color order, then cardigans, then jackets. That sounds kind of complicated but it’s not once you get used to it! You could also consider categorising by clothes type, for example work clothes, casual clothes, smart clothes, or just by using color. Play around and see what you like. You can buy dividers to label your sections if you like, or make some like the ones below. 10) Make the most of it! When you get through it and come out the other side with a perfectly sorted wardrobe, stand back, admire it, and give yourself a huge pat on the back! You’ll find that you naturally wear more of your clothes and try out different ways of wearing them, plus you’ll have a little happy moment every time you open your wardrobe. If you want to go the extra mile then download the ‘Stylebook’ app. If you’re old enough to have watched Clueless, this will definitely make you feel like you’re having a Cher moment!! 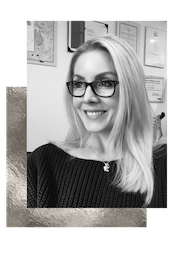 You basically take photos of your clothes and accessories, or download them from shop websites, categorise them in your virtual closet, then have fun playing about planning your outfits! 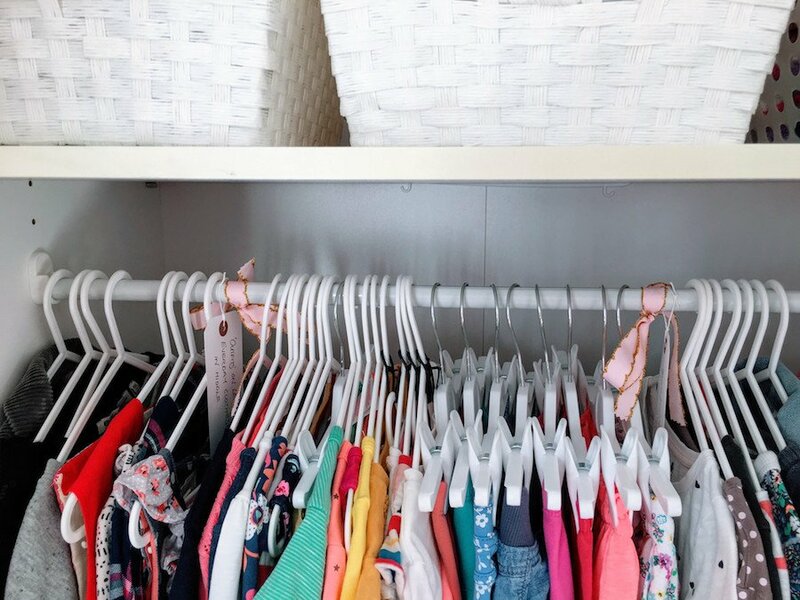 You can save your outfits and categorise them too – so for example, you could have a virtual work wardrobe, a virtual summer holiday wardrobe, and a virtual staying-at-home-looking-after-kids-but-not-wanting-to-be-a-complete-scruff-bag wardrobe! 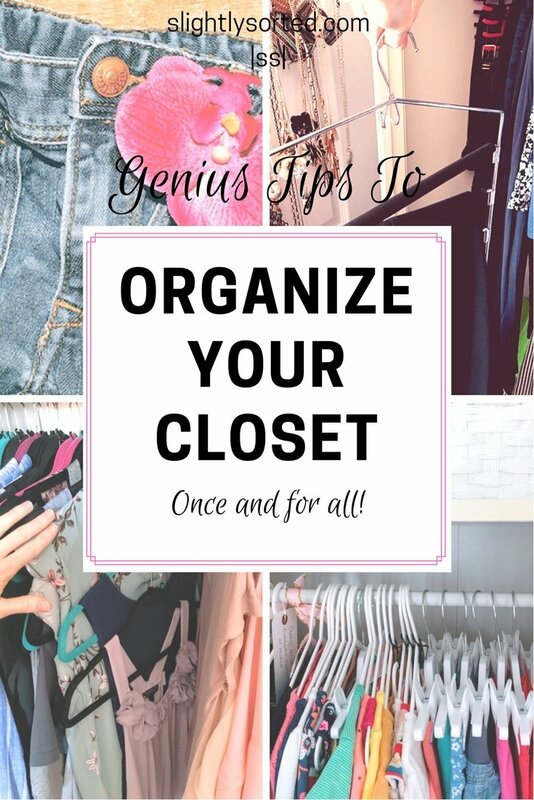 So there you go then, I hope you’ve found these tips on how to organize your wardrobe helpful! Let me know if you’ve tried any of them out and what you thought, I always love hearing from you. 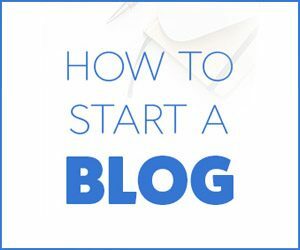 Do you have any tips of your own to share? 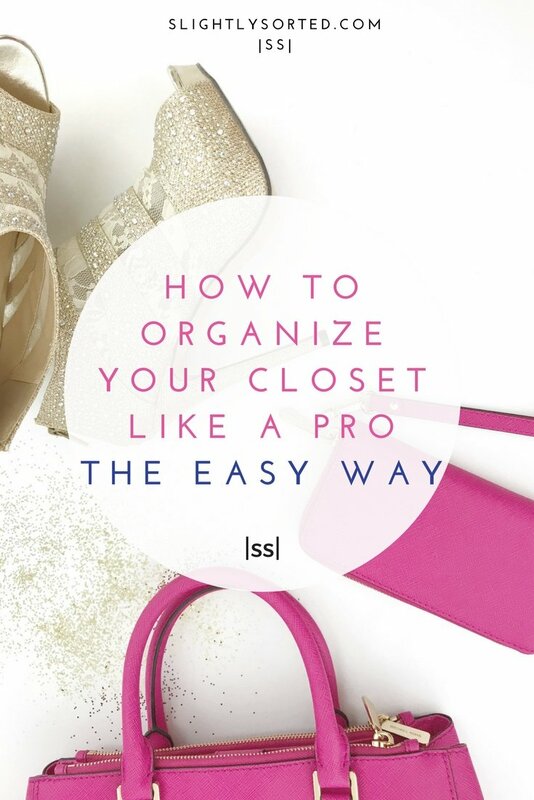 Enjoyed this post on how to organize your wardrobe?… Why not save it for later on Pinterest? Previous Post How To Use Packing Cubes To Organize Your Suitcase!